What is economic growth? And why, historically, has it occurred in only a few places? Previous efforts to answer these questions have focused on institutions, geography, finances, and psychology. But according to MIT's antidisciplinarian César Hidalgo, understanding the nature of economic growth demands transcending the social sciences and including the natural sciences of information, networks, and complexity. To understand the growth of economies, Hidalgo argues, we first need to understand the growth of order. At first glance, the universe seems hostile to order. Thermodynamics dictates that over time, order-or information-disappears. Whispers vanish in the wind just like the beauty of swirling cigarette smoke collapses into disorderly clouds. But thermodynamics also has loopholes that promote the growth of information in pockets. Although cities are all pockets where information grows, they are not all the same. For every Silicon Valley, Tokyo, and Paris, there are dozens of places with economies that accomplish little more than pulling rocks out of the ground. So, why does the US economy outstrip Brazil's, and Brazil's that of Chad? Why did the technology corridor along Boston's Route 128 languish while Silicon Valley blossomed? In each case, the key is how people, firms, and the networks they form make use of information. Seen from Hidalgo's vantage, economies become distributed computers, made of networks of people, and the problem of economic development becomes the problem of making these computers more powerful. 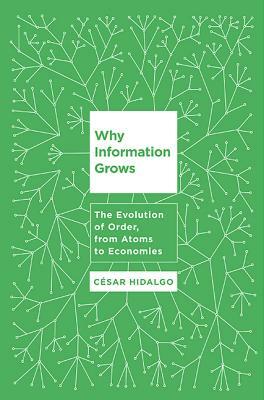 By uncovering the mechanisms that enable the growth of information in nature and society, Why Information Grows lays bear the origins of physical order and economic growth. Situated at the nexus of information theory, physics, sociology, and economics, this book propounds a new theory of how economies can do not just more things, but more interesting things. Cesar Hidalgo leads the Macro Connections group at the MIT Media Lab and is an Adjunct Lecturer in Public Policy at the Kennedy School. A trained physicist, he also has extensive experience in the field of economic development and has pioneered research on how big data impacts economic decision-making.